Crambe abyssinica Hochst. ex R.E. Fries (n = 45) is an industrial oilseed crop that is high in erucic acid. It is most closely related to C. hispanica L. (n = 30) and C. glabrata DC. (n = 15), although the latter species is most often included in the synonymy of C. hispanica. The species complex extends throughout the Mediterranean region, Ethiopia and East Africa. Crambe abyssinica is endemic to Ethiopia, C. glabrata to Spain, Portugal and Morocco, and C. hispanica is distributed in the Mediterranean region and Middle East. 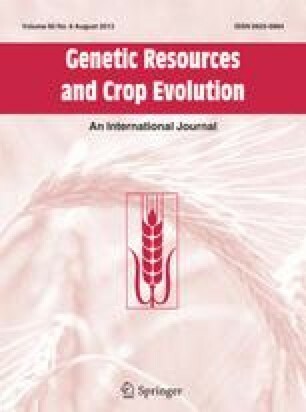 The present study compared genetic relationships among C. abyssinica, C. hispanica and C. glabrata and attempted a taxonomic separation of them using traditional morphological traits, agronomic and seed quality data, chromosome number, and various molecular data sets including nuclear-DNA based RAPD data, chloroplast (cpDNA) restriction site data and ITS sequence data for the internal transcribed spacer region of the nuclear ribosomal DNA. The three species can be distinguished most reliably by chromosome number. Accessions could generally, but not always, be distinguished morphologically by plant branching pattern, fruit articulation and colour, leaf pubescence and leaf shape. cpDNA restriction site data and ITS sequence data, two relatively conserved DNA data sets, supported the recognition of C. glabrata as a distinct species separate from the C. hispanica/C. abyssinica accessions. Within the latter group, both RAPD data and field evaluation data revealed greater amounts of genetic variation in C. hispanica compared with accessions of C. abyssinica, with the latter included as a subset of C. hispanica. Crambe glabrata was genetically distinct for all data sets and warrants separate species status.